If camping outdoors with large groups is your thing, you definitely need spacious, sturdy accommodation like a tent that can handle at least 10 people. Big tents tend to have lots of room for sleeping areas and if less than 10 use the tent, there is lots of additional storage area. Although big tents are all designed with big groups with up to ten people and their relaxation needs in mind, each person’s requirements is unique and what is perfect for the camping adventure of one will not necessarily suit another. Different features of one tent might appeal to some, while others are a must-have for others. With the 5 tents reviewed here, we list what we feel are the pros and cons of each. We hope this will help you decide which one is best for you. If the whole family or groups all sleep in one tent, younger children will tend to feel safer and happier at night knowing that their parents are close by. Even when using a tent that has specifically been designed for 10 people, you’ll need to make sure it will be able to handle everything a busy group will throw at it. Just in case you are in a rush, or want a quick overview of how the 5 x 10 person tents fair in our review below, we have created a table for you to quickly scan and check prices on amazon. The Mountain Trails Grand Pass Tent is light-weight and was designed for devoted campers. The air in the tent will stay cool and fresh during warm nights due to the zip-open windows, large roof vents and the detachable fly. It also features Dutch “D” doors that are fitted with interior scoot windows to provide personal privacy at all times. This tent is awesome for group camping as it can sleep up to 10 people quite comfortably. Apart from being able to sleep comfortably inside this tent with a group of up to 10, it also has ample space for all the gear you need. 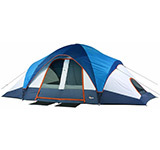 This huge camping tent is ideal for group or large family camping. Occupants have plenty of room to store equipment, stand and stretch out. The tent is also very easy to set up. The Grand Pass can easily be separated into two rooms for extra privacy. The Coleman WeatherMaster is a dome tent suited for 10 people and it will keep you relaxed and dry on any camping trip, even if the weather is not that good. The tough waterproof floor has welded floor seams that prevents water from oozing from the ground into the tent. 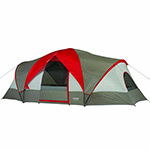 The tent is fairly easy to erect and light-weight. The huge hinged door is easy to use and makes it feel as if you’re at home rather than being out-of-doors. The room divider will split the tent into two equal sections for privacy, meaning you could have two 8.5ft. by 9 ft. rooms, or one huge room. The 10 Person Coleman WeatherMaster Tent handles bad weather pretty well, due in part to the inverted seams and welded floors. The bathtub design style prevents any leaks from the ground below. Even though the tent is named the WeatherMaster it does however still need weathering and sealing as does any other tent to make sure you get the most out of it. If you find pitching the tent a real hassle and a chore to do, you’ll love the color coded poles that make this job so much easier. Although this may sound like a simple thing, this type of devotion to detail is apparent in all elements of the tent. The Coleman WeatherMaster will deliver the best performance when used for relaxed camping in fair weather focusing on relaxing and not fighting bad weather simply because you can. The Coleman WeatherMaster should however be on your shortlist if you are likely to camp in a location with a high probability of wind or rain. The Coleman WeatherMaster range has undergone rigorous testing throughout its development. This dome tent is huge and has three family rooms able to sleep up to ten people. For waterproofing and durability the polyethylene floor is heavy duty and has seams that are welded. Air flow is increased on hot nights via the mesh roof, while the polyester fly covering most of the tent keeps you dry during the wet season. The interior space can easily be separated into 1, 2, or 3 rooms via the detachable room dividers, making the tent ideal for various sized groups or families. There is ample ventilation even during the hottest nights, provided by the mesh door, 4 windows and 3 mesh roof vents. Setting up the Wenzel Great Basin 10 person Tent is really easy, and families and groups will love the sleeping area provided. The available space can easily be divided to provide flexibility for family members and groups. Extra details like hanging pockets and a gear loft provide plenty of extra storage space. This tent also resists rainy conditions pretty well. 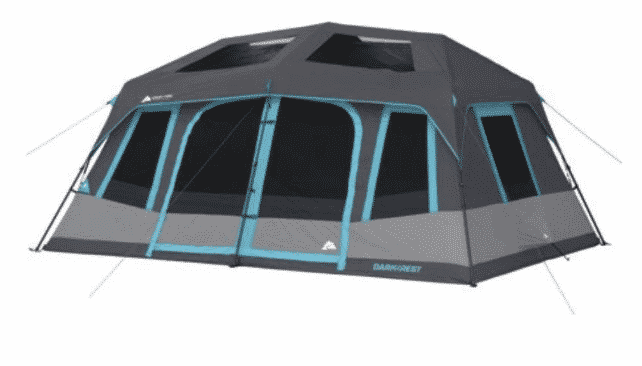 The Ozark Trail 10 Person Tent has plenty of room for the whole family and all their gear thanks to 78” headroom in the middle and 184 square ft. of usable floor space. 3 rooms can be created by using the 2 room dividers that can be detached. 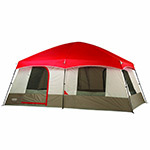 This Ozark tent is fashionable with its beige, black, and red colors. Fantastic airflow is achieved via the mesh roof and 7 zip windows. The canopy can also zip down for extra privacy. The featured dirt mat built into the front assists with keeping the tent’s inside clean. Extra weather protection is provided via the front canopy. The 3 room tent is easily portable when packed in the zippered, rugged carry bag. 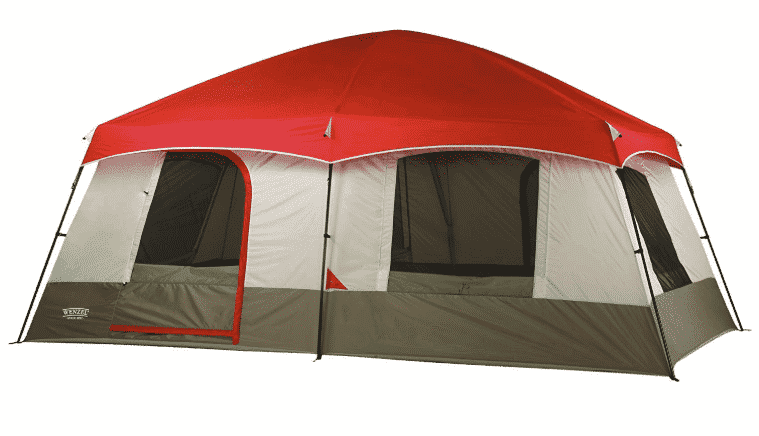 It is a great tent that offers lots of space for friends and family. The Wenzel timber Ridge 10 person Tent is not so much a dome as the Great Basin model from the same manufacturer, but is more of a cabin style tent. Both tents use a rainfly for the roof and the standing height of 93” for the Timber Ridge is great. This tent has 6 windows and 2 entrances, allowing plenty of ventilation and light. The floor space of 160 sq. ft. can easily sleep 10, but you might prefer taking a smaller group and have more living space available. 2 people can relatively easy setup the easy design that incorporates a light, strong fiberglass roof frame and strong steel uprights. These are interconnected via the central hub. The result is a sturdy construction that withstands rough weather easily. This tent is very stable and can easily handle strong winds. The tent’s actual floor is very tough and no additional groundsheet or tarp is needed. 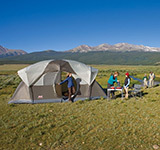 This feature is not available in many tents and it is worthwhile spending the few dollars more than what the Wenzel Great Basin costs simply to have this feature. Although the mesh roof prevents the addition of hanging storage from the roof, there is however a convenient storage duffel provided. The internal area is also very big, making it easy to add a few storage bins for extra gear. 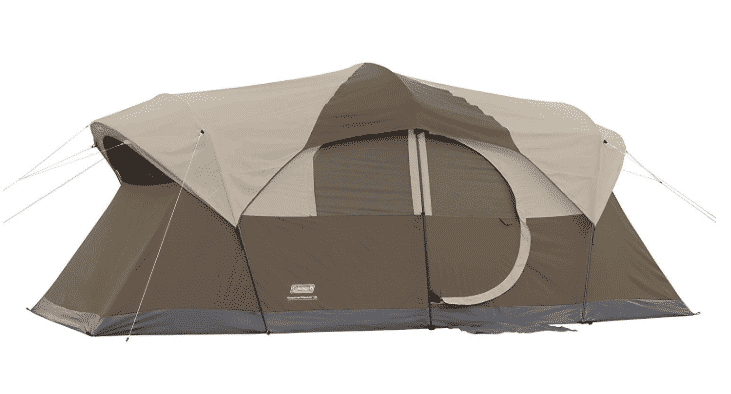 In our view, the best 10 person tent of those reviewed here is the Coleman WeatherMaster. Although it costs more than the others, the tent is made from high quality materials and providing your budget allows it, the extra cost is well worthwhile. To keep the tent secured to the ground and stable, we do however recommend that you buy better quality tent pegs. The Wenzel Timber Ridge comes in second place with its durable floor material making it well worth considering. This tent is definitely a long term investment due to the internal height and the cabin structure. This is an excellent 10 man tent, but the quality of the tent material does not quite match up to the Coleman. Both the Wenzel Great Basin and the Ozark are also great budget tents. They both have plenty of excellent features and offer good value for money, especially if you don’t go camping that often. For regular campers that do have the budget, there is not really anything that beats the Coleman. PrevPreviousMost Stunning And Challenging Idaho Hiking Trails Revealed!